To my surprise, I found these gorgeous royal blue rice bowls hidden in a box that I abandoned in the storage. I totally forgot about these beautiful bowls for a few years. The memory started to flow and I remembered that I got them somewhere near Yangzhou Yangshuo, China. 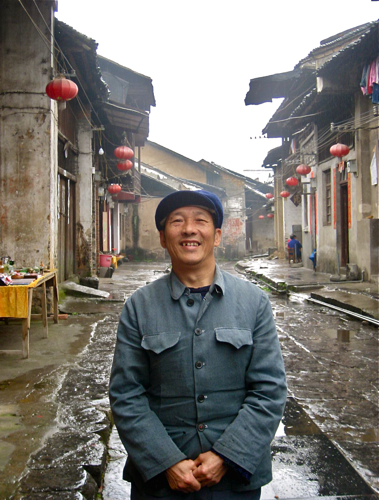 I traveled Guilin and Yangzhou Yangshuo, two of the most scenic old town of China, several years ago. The scenery along the Li-river supposed to be stunningly beautiful and I was excited to enjoy it, but alas! It was raining and foggy when I took the cruise. All I saw was the misty fogs and the silhouettes of gorges behind. 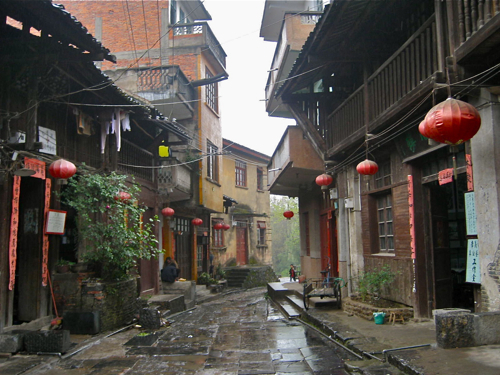 With disappointment, I was walking on rural streets of unknown town near Yangzhou Yangshuo without much expectation after I landed. I came to one street and saw one guy standing under a roof to avoid the rain. He had a small table with yellow tablecloth and selling some old odds and ends, all dusted. I suddenly remembered the story of a couple I knew who traveled to rural town of Guangzhou province in China a long time ago. They got a blue and white vase as a souvenir from their trip. An old man had a table with dusty old stuffs in a random quiet street waiting for someone to stop by, just like this man in Yangzhou Yangshuo. The old seller asked for the fake Rolex watch that the husband was wearing. The couple told the old man that it was a fake Rolex but he wanted to trade his vase with the watch. His wish was granted and the couple took the vase back home. Later the husband had some feeling about the vase and had it appraised by an antique expert. It turned out the vase was the real antique all the way from the late Ming dynasty and worth a lot more than even a real Rolex watch would have been. I wasn’t expecting the same kind of luck from my Yangzhou Yangshuo man but I liked a pair of his rice bowls. Upon my return I forgot about the bowls and the trip ever since. 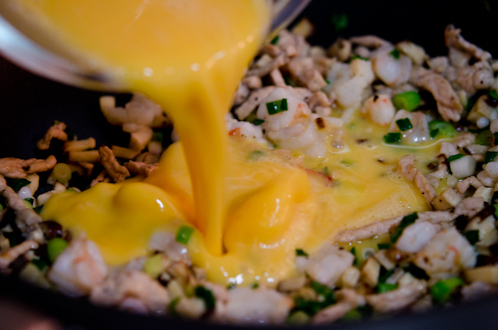 It is the original fried rice that goes back to Sui dynasty around 600 AD. If you are imagining of one of those fried rice you order at your neighborhood Chinese take-out restaurants, the answer is NO! Those are American version of Chinese food. Chinese food that local Chinese eat in China, Taiwan, or anywhere Chinese is spoken, is very different than what other parts of world think it is. This is the kind of fried rice that you order at Din Tai Fung or Christal Jade La Mien Xia Long Bao of Singapore, the very popular Chinese franchise restaurants. This is the kind of fried rice that my husband and kiddos can’t get enough of. So, forget about those dark brown fried rice from your local Panda Express. 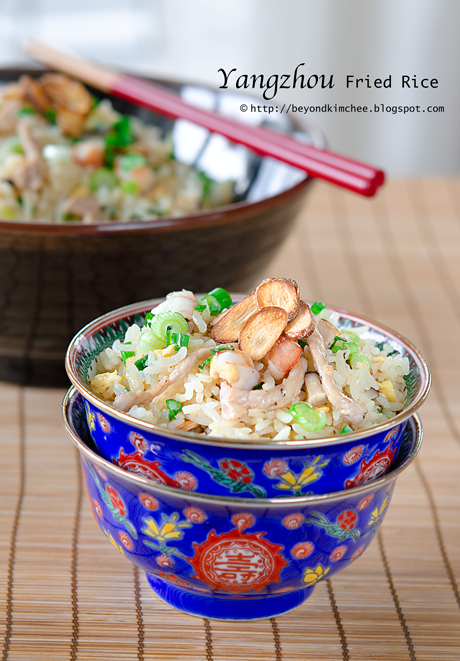 Let’s learn how to cook authentic fried rice that Chinese eat, the Yangzhou style! First and the most important ingredient; the rice! You want your rice to be chewy in your fried rice. Use long grain rice, NO short grain! 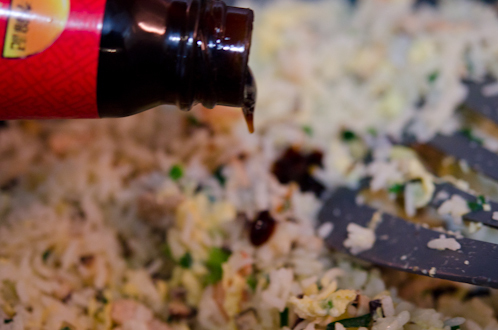 Fluff your rice after it’s been cooked and keep in the fridge for at least couple of days. Chilling the rice will make rice to loose its own moisture and becomes dry and chewy. 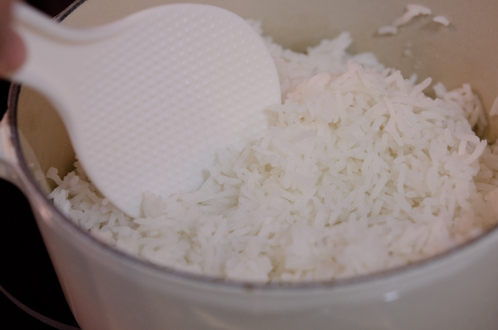 Make sure to loosen your rice to remove any huge lumps. Choose your proteins to suit your taste. 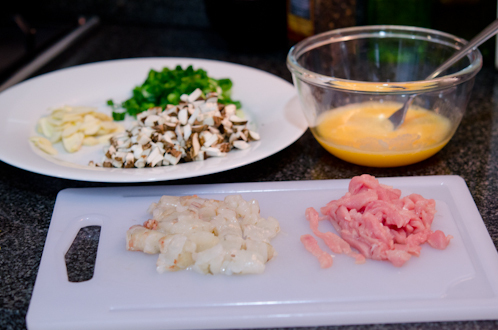 Shrimp, pork, ham, scallop, or chicken… Shrimp and pork are my chosen partners of the day. Season with salt and pepper. 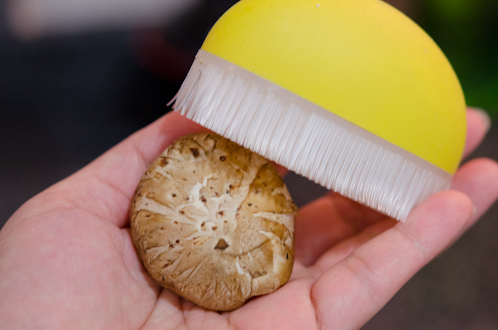 DO NOT wash your mushrooms. Just brush off to remove any dirt if you see. 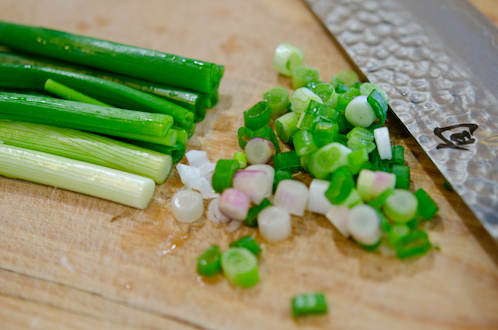 Green onions? Chop, chop, chop, too. For garlic? NO chop, chop, chop! Just slice them thinly. 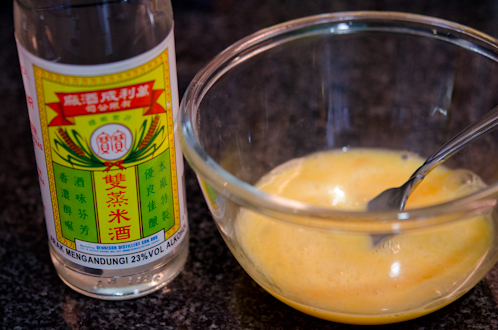 Combine your eggs and rice wine, and beat them together. IMPORTANT! Make sure all your ingredients are in standby position right next to you. This is the key technique of making any stir-fry dishes. Place your wok over a MEDIUM heat. This is not a time to use your French omelet pan. Chances are, your rice will fly out and spread all over to your kitchen stove. Use a Chinese wok if you own or deep stir-fry skillet like the one I have. Add oil and garlic slices. Fry them until they are golden brown. Your are infusing the oil with garlic flavor. Be careful to not to burn them. 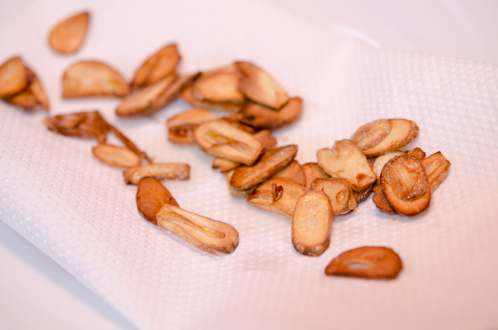 I like to use these fried garlic in the dish, but you don’t need to. These will add nice garlicky fragrance in the dish. Now set your flame to HIGH! Time to stir fry! 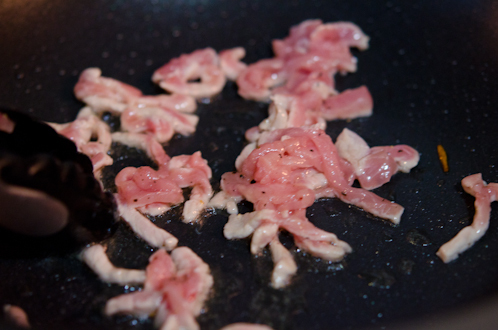 Add your pork and stir fry until they are no longer in pink. 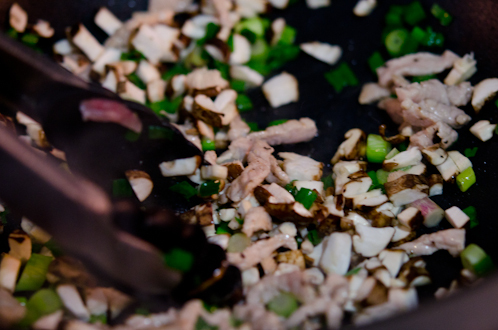 Add mushrooms and green onions. Season with salt and pepper, and stir fry for 30 seconds. And add the rice. Don’t worry to cook the eggs all the way at this point. You want your eggs to be slightly wet. Keep stirring until everything is well incorporated. You can see the eggs are binding with rice and getting fried together. Add oyster sauce. If you can access XO sauce, which is scallop based sauce, that would be fantastic. But oyster sauce will do fine. Taste some to see if seasoned right. Add more salt if you need and finish with a few dashes of freshly ground black pepper.I like to sprinkle the fried garlic slices on the rice; adds nice crunch and flavor! Well, I don’t think my blue rice bowls are several hundred year old antiques. it would complete the authentic Chinese dinner night. 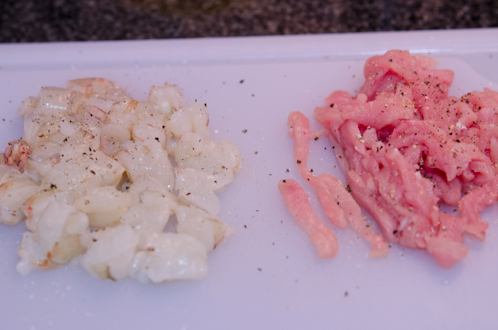 Season each pork and shrimp with salt & pepper, set aside. Combine eggs and rice wine, beat well in a mixing bowl. Set aside. Make sure all the ingredients are ready to go. 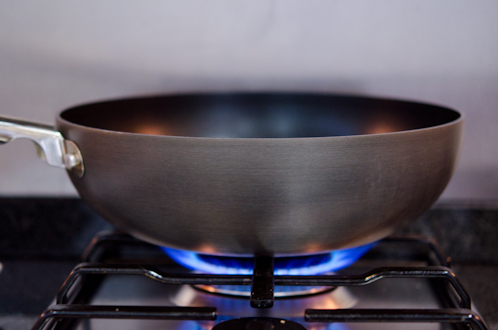 Bring a wok or deep stir-fry skillet to medium flame. Add oil and garlic slices to infuse together. Brown the garlic until golden brown and crisp. 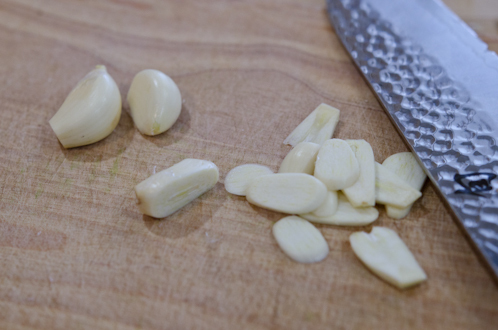 Strain the garlic from the oil and reserve for topping. You will smell the garlicky aroma from the oil. Raise the heat to high. Add pork and stir fry until no longer in pink, about 1 minute. 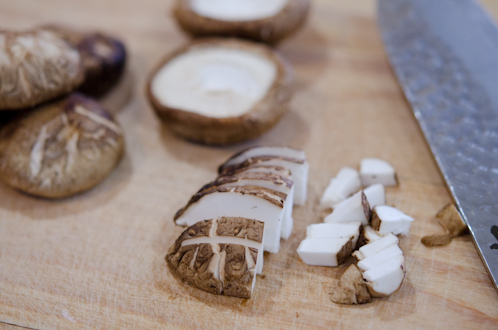 Add mushroom and green onion, season with some salt & pepper and stir fry for 30 seconds. Add the shrimp, and stir fry for another 30 seconds. Add more oil if neccesary. 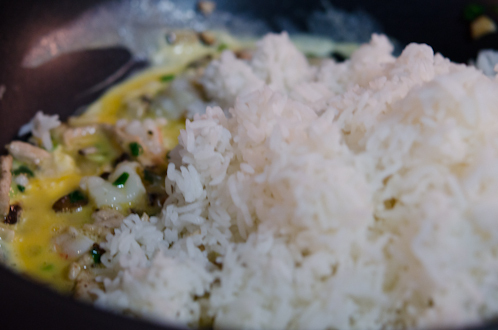 Add the beaten eggs, stir for 5 seconds and add the rice while the eggs are still wet. Add the oyster sauce and stir fry the rice mixture breaking lumps, if there is any, until everything is well incorporated. Taste to see if you need more salt & pepper. Adjust seasoning according to your taste. 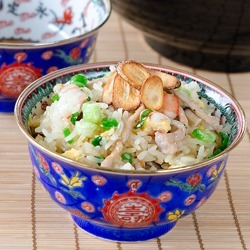 Place the fried rice in a serving bowl and sprinkle with the reserved fried garlic slices. Serve immediately. 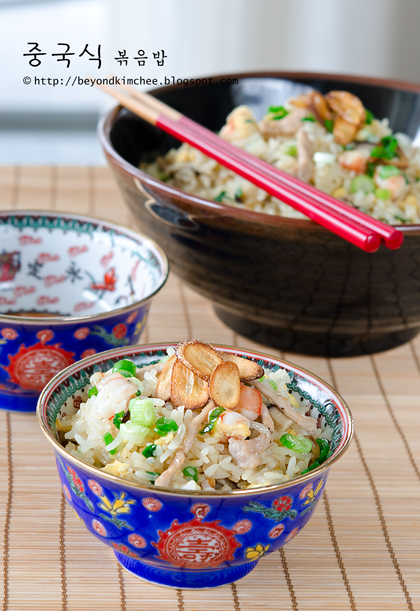 The fried rice and those cute little bowls just look so good together! Thank you for the wonderful tutorial on how to make this fried rice! The pictures are beautiful and I enjoyed hearing how you acquired your beautiful bowls. I am going to make this rice very soon, probably this weekend. Again, thank you and Happy Chinese New Year! Thanks Maria! Hope you enjoy the fried rice and let me know how it turned out. Have a great weekend! Wonderful pics and your rice bowl are just gorgeous. Holly, your photograph of the village street, with cobblestone street wet from the rain and the yellow house on the left is absolutely breathtaking! Looking at it makes me feel as if I'm there on that rainy day too, somehow. Thank you for sharing these lovely memories and this delicious-looking recipe! Thanks Erica. Actually the picture was taken by point and shoot camera (It was long before I had DSLR) but turned out pretty good. Sometimes those little digital does wonderful job. Holly - I agree those bowls are gorgeous! Your photos are beautiful as well. Those bowls look like they are going to pop out of the photo. The fried rice looks delicious! I enjoyed reading about your trip as well. Oh those rice bowls are just stunning! The rice looks delicious too! This is such a great post - you have a lot of good stuff going on here. First, I love the story about the vase and the fake Rolex watch. Second, those bowls are wonderful - and I really enjoyed reading about your trip. Third, I slice garlic the same way you do! I love to bite into garlic - when you mince it, you lose that. 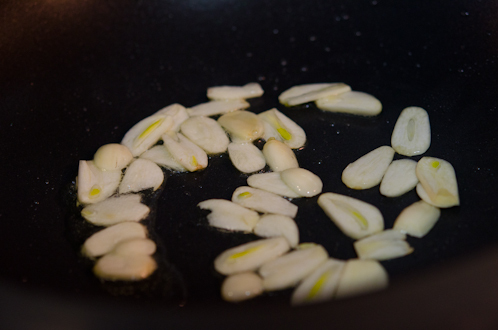 BTW, I also infuse the oil with the garlic - but I tend to do that towards the end (after I cook the meat). And I always leave my garlic in the dish, although I like your idea of using it as a garnish. Fourth, great recipe. I have to admit my fried rice often is the variety that comes out looking brown - too much soy sauce! Your recipe looks terrific. Anyway, thanks for a wonderful post. Thank you. I love the crunch toasted garlic sprinkled on top of fried rice. I could hardly go back to Chinese take out fried rice ever since I tasted authentic fried rice. Those are beautifully colored bowls ! Wonderful recipe, but not sure the heritage is accurate, sorry - I may have a misunderstood, but I think you travelled from Guilin to Yangshuo along the Li river, and it is indeed fabulous, having lived there briefly. 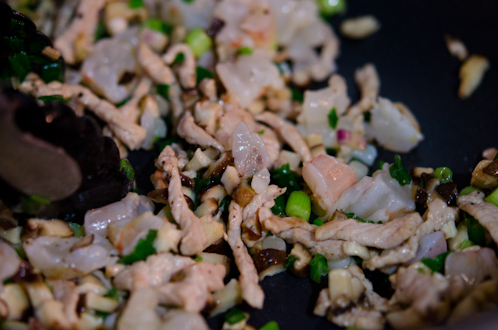 However, Yangzhou fried rice doesn't have its origins in Yangshuo. I think you are right. Yangzhou and Yanshuo are two different places. Yanzhou is near Nanjing, and Yangshuo is near Guilin and that is where I had been. Although I had Yangzhou style fried rice in Yangshuo and I thought they are same place with different sound. Thanks for pointing out. What is a good brand of long grain rice do you recommend for this recipe? Thanks! 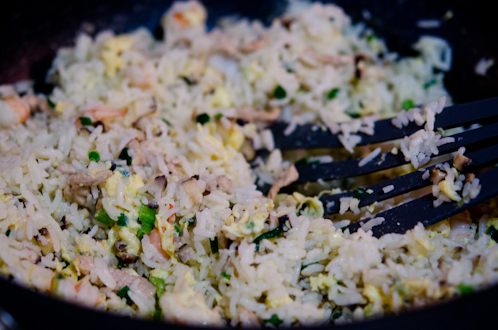 do you know the recipe for din tai fung fried rice? what kind of rice they use? any other ingredients? Hi there, i read your blog occasionally and i own a similar one and i was just wondering if you get a lot of spam remarks? If so how do you reduce it, any plugin or anything you can suggest? I get so much lately it's driving me mad so any assistance is very much appreciated. I use Akismet to block some of the spam. Oh my!! this blog is what I was looking for my entire life! well some years... 2 years since Im married ;) Love love love your tutorials the pictures your travels and hope your feeling better soon! xoxo from Peru!! Hi Holly, Im a muslim and i cannot use rice wine.what can i use for substitution? Hi. Stumbled across your blog when i googles 'Din Tai Fung fried rice'. Lovely blog you have!